I started stamping between 1998 and 2000. It all began when I became a SAHM. 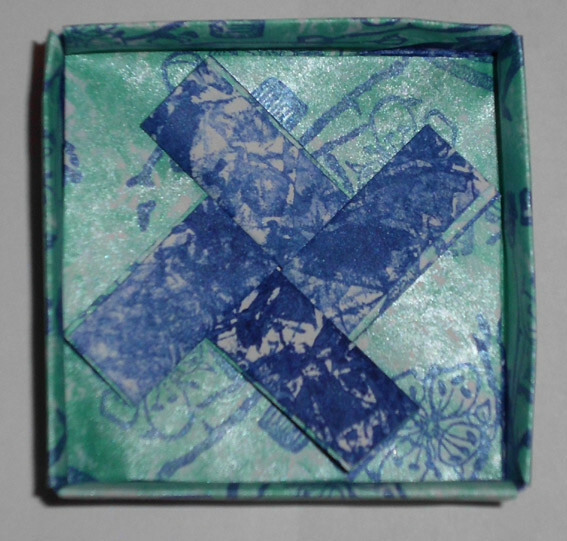 I decoupaged boxes and I created personalized birthday cards for family members. My mother-in-law(a crafter with children most of her life) gave me my first stamps as a birthday gift. Additionally I was hooked on collage when my hubby accompanied my first steps into the world of the internet. Do you remember the Gingerwood rubberstamp link collection ? Rebekah Houdous´ Tag Art site was my first favorite 🙂 and I was very excited. Also I had decided to contribute some Christmas cards to a bazaar arranged by our kindergarten. At the same time I came across a little German creative stamping magazine mostly done by Heindesign and I wanted to do something different than 3D Whew – how little did I know 🙂 ! I discovered another stamper nearby (which was a miracle then shortly after we had moved to the middle of nowhere – this was how it felt after living in Hamburg for 16 yrs) who introduced me to egroups which is Yahoo today. I joined my first stamping group and one of its members pointed me to OSA. This must have been in spring 2001. 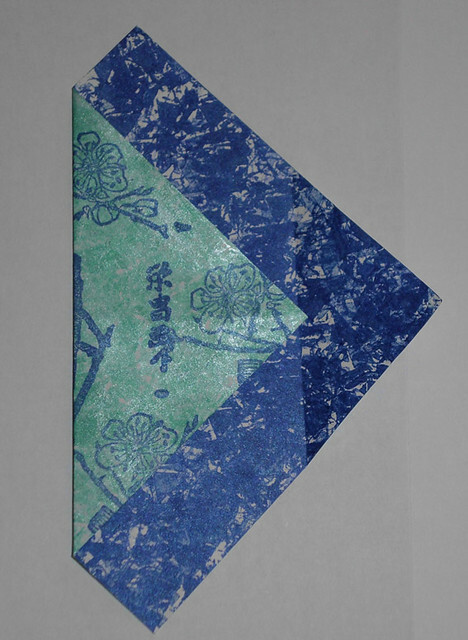 It was just in time to jump into my first swap ever which was a collaborative book project hosted by Australian stamper Sue Raison “Thoughts from the East” . Also discovered my love for haiku poems then. The fun is the unforeseen result of an experiment. This might be because I´m more a messy than a precise worker. My art teacher at school always said…. don´t use an eraser .. go with what you have drawn and see where it takes you. When I create this is a motto of mine. I love the process. Very intuitive – no planning. There is no favorite stamp company. I prefer no cute style but when it comes to Christmas stamps I might get weak…. I rather collect elements that are versatile to put together and collage with. Well – none. I love Stonehouse Stamps as much as Artneko , Non Sequitur and About Art Accents or Stamp Francisco. My score board and…. some punches that make my work look neat LOL. As of recent I absolutely love my new speed ball brayer. After 10 yrs of stamping I managed to buy me soft rubber brayer. It´s fantastic ! I like all colors…. but I get lost in blues and greens . I like to keep it simple and flat , so it´s mostly eyelets and ribbons or a little origami folding. My paper cutter… I´m lousy at cutting. Don´t hesitate to ask questions. Don´t hesitate to show your work. Take time to look at nature for inspiration. Connect to the beauty of mother earth. Be playful. I like to listen to music that makes me dream and relax…easier to get into the zone then. Be curious. Experiment. There is something exotic and mysterious about the Asian people at least that´s what I think . It is probably the fascination of the unknown. The East is so different from our western culture. For many years I´ve been attracted to Zen in all its varieties. I love to incorporate words into my art so Haiku is the perfect match. Well – I´d love to travel to the US one day and shopping surely would be a point on my list but I would have to choose I´d rather love to meet long year email friends. Fortunately we have the internet. Maybe you´ll find me putting up a tent nearby a large bookstore. Stamptalk and some mixed media art groups. No club. OSA has become my stamping home. No other community is as friendly, caring and sharing and consistant in its group philosophy. I appreciate this so much. In my first stamping years I read Somerset. At some point I felt I got manipulated somehow and all the pictures covered my own ideas so I stopped reading magazines. If I need inspiration today I surf the net or grab into my stash of collected magazines. I´m waiting for Vamp Stamp News to be edited electronically (waving to Nancy). I have been published in TAKE TEN twice. This is a couple of years ago. Non-oriental cards. This winter I have discovered my sewing machine. Did some felting for beginners. Love gardening and animals. And my first love are books (reading and binding), my second was the guitar. From time to time I dabble in polymer clay and make some jewelry or create digital collages. Curiosity, the wish to express myself, the wish to create beauty around me, something useful and pretty, to make a friend or a loved one smile. Last but not least to see if I can do it. Painting (grandmother), music (my dad) and my mom has been a crafter all of her life. I took different online classes in collage before 2008 but mostly I do book studies if I´m interested in trying something new. Let me think…I once sponged a black lamp stand with golden Brilliance ink.. I´ve explored fabrics and different surfaces like cd´s and candles– I use to poke in hubby´s toolbox if a special tool is lacking. In my collection of embellishments there are some fish hooks , too. Meanwhile I follow quite a few blogs of fellow artists. For instance I like the techniques of Michelle Zindorf. From time to time I work thru a Stampscapes tutorial because I still haven´t given up on scenes. I like Splitcoast. I´m a housewife and SAHM and I love the independence this gives to me. I had several little jobs for a couple of months in 2007/2008 and before family I was an application programmer on a BIG BLUE system. In 2008 I participated in a year long workshop series of energetic healing and I´m still continuing this journey and meditate regularly, learn about bach flower remedies, homeopathics, chinese medicine and family constellations. This all works together well and brings a lot of healing and love into our world and I´m thankful to be a contributing part of it. My family is my ever so supportive husband , my daughter of 15 and my son of nearly 13. A tomcat of 10 yrs that doesn´t always behave like a cat is also living with us. We live 40 km north of Hamburg in Schleswig-Holstein, the most northern state of Germany. It´s a place with about 6,000 souls and all stores are in walking distance. When the kids were small and hubby needed the car each day I did everything by bike. Today hubby is working from his home-office and when he is not he is travelling around the world designing and building data-centres. loves to write stories and to sing and of course computer chatting, my son loves all things mathematical , music, his waveboard and computer games. We all love fantasy and science fiction :). Since we live relatively close to Denmark our summer vacation at our favorite Danish beach together with my sister´s family is a long-time ritual. 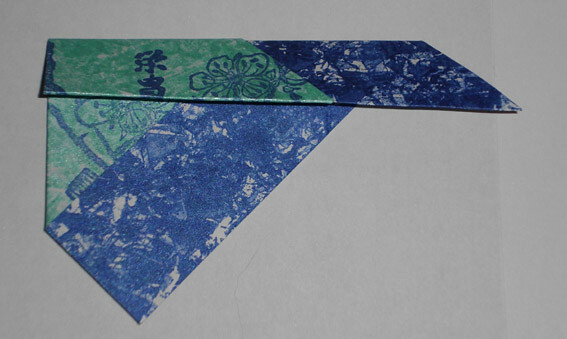 8 squares of stamped paper of identical size, you could also use Washi of course or vellum, I tried scrapbook paper and this works beautifully , too. 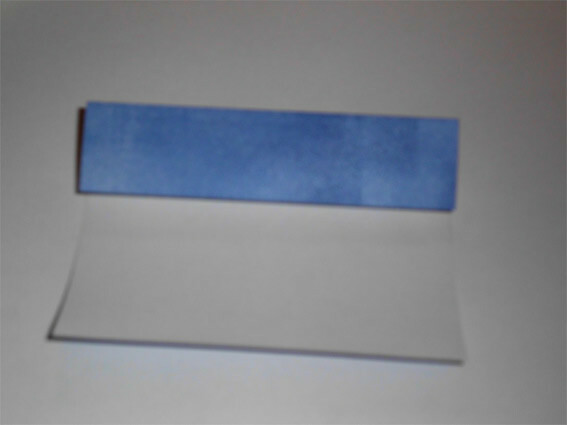 If you use thicker paper you will need a bonefolder or some similar tool. and I used crumpled newspaper to stipple the background and a cherry branch stamp. You need 4 squares for the lid each of them folded the same way. You see two elements finished. 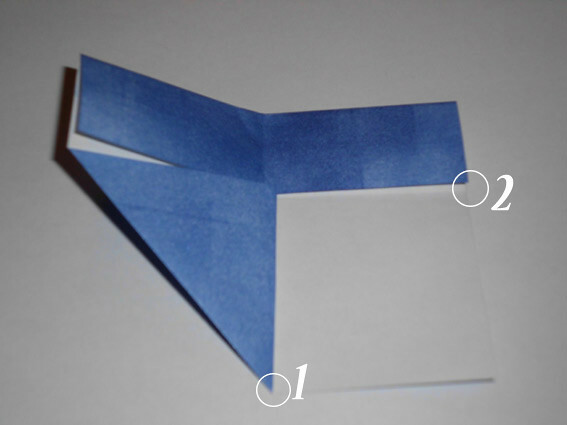 For the first step you need two diagonal folds and only crease in the middle for a couple of centimeters or say 1.5 inches. 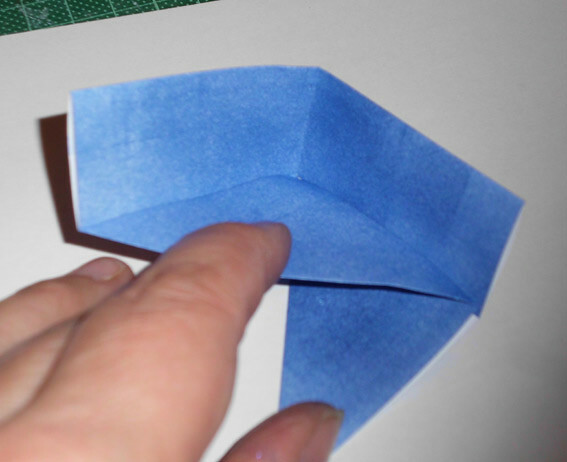 Fold the right corner to the center and unfold again. 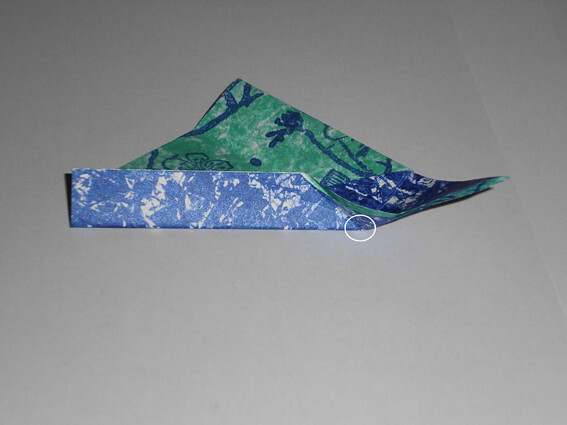 Fold the left corner to the crease that was created in the last step. 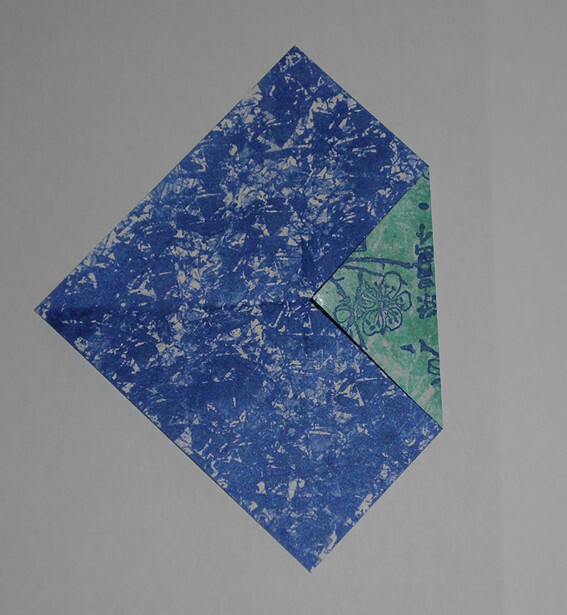 Make a mountain fold downwards into two halfs. 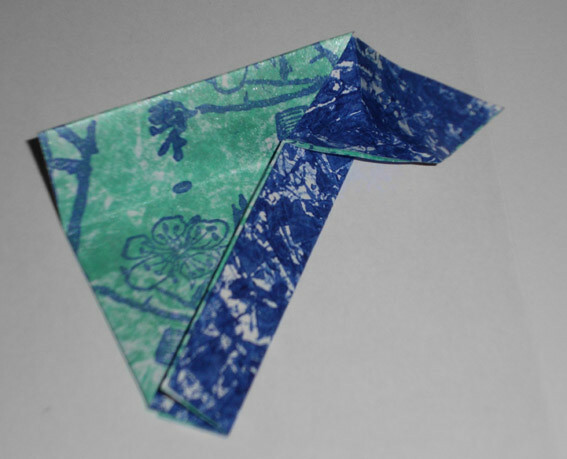 Fold upper edge down up to the mark (see photo 5) and unfold. 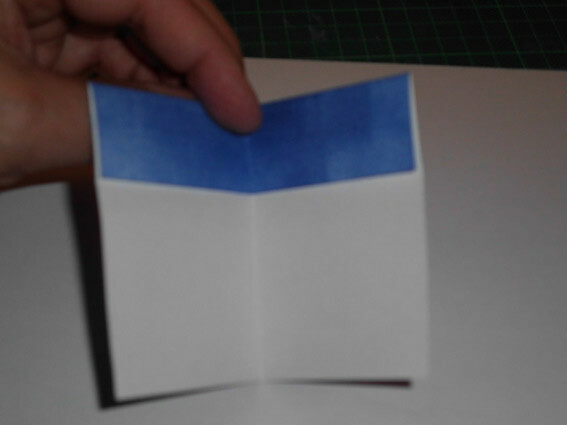 The two lines that overlap now mark the end of the next folding. 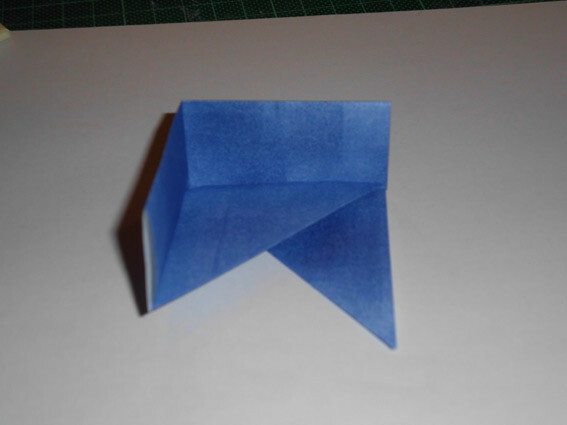 Fold up side stripe with valley fold – stop at circle mark. Pull down right corner and straighten up side walls. One of four pieces is done. Push right corner of left element into the opening on the left side of your second element. pushing the pieces together by carefully pressing the corners to the center. This is more stable than pushing the flaps. The lid is done ! Now I´ll do the bottom. 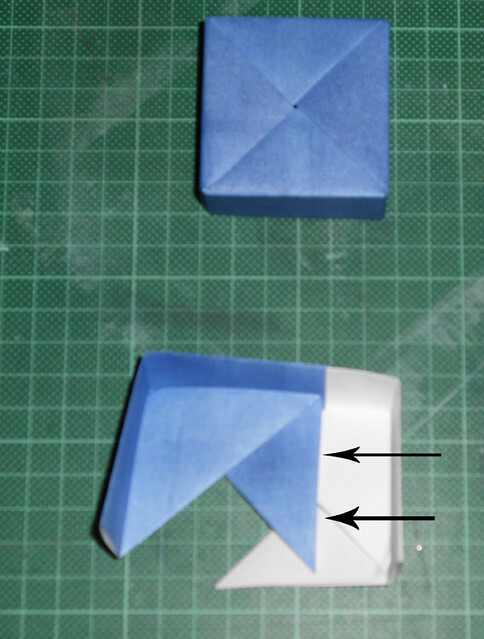 Fold paper in half and unfold. Fold upper half in again with a mountain fold. Fold in half vertically with a valleyfold . 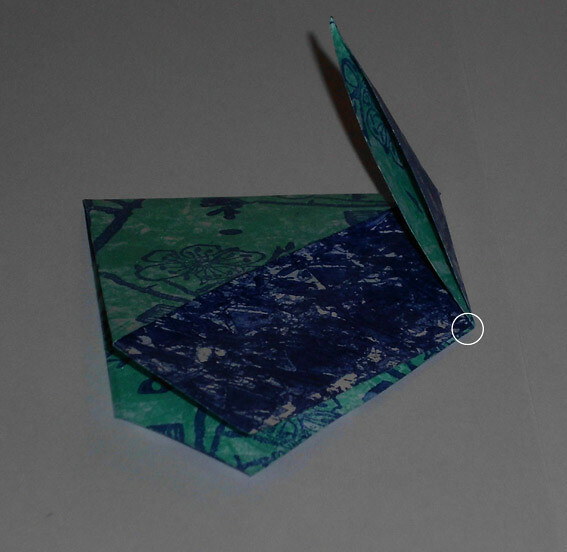 Fold left corner to the middle. 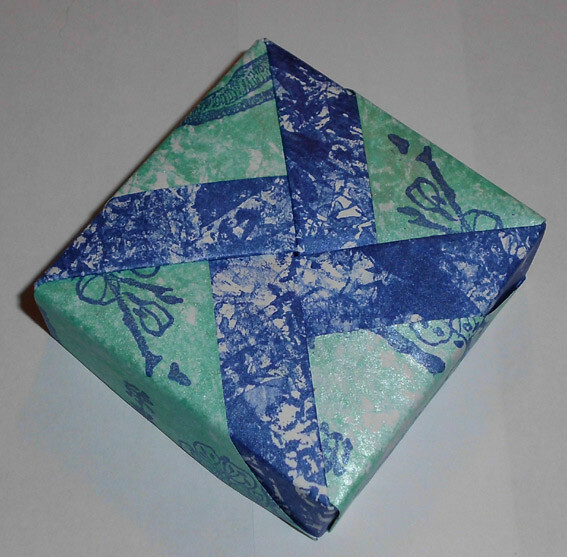 Fold and match mark 1 with mark 2. This is how it looks like after the last step. down the rest of it onto the triangle as shown below. 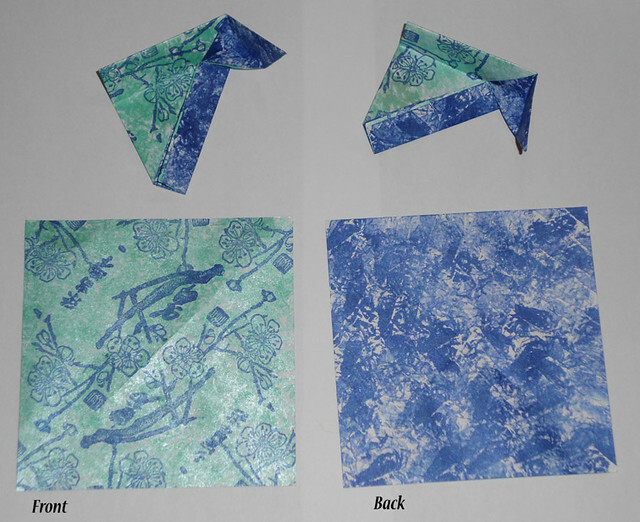 To show how you put the bottom pieces all together I have made one piece out of white paper. The right(white) one goes into the open of the left one. For me it works best if I put two and two together. 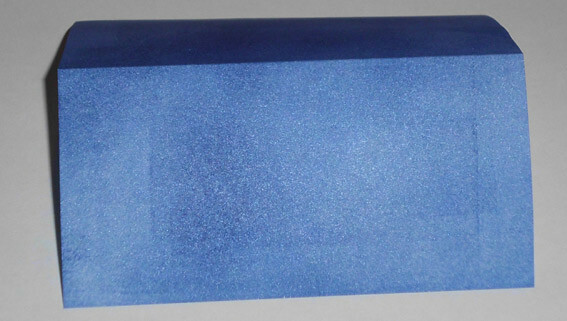 The finished box-bottom is in the top on the photo. Again if you have pushed all parts slightly together turn around and press the corners until corners are neat. This is more stable. for jewelry or so. Don´t let the pieces confuse you. It´s geometric :-). 12 Responses to October 2011 – Sabine V.
A beautifully intricate project, Sabine. Congratulations on being the SAM this month! Congratulations to Sabine, the SAM of October. Sabine enjoy your month of fame. 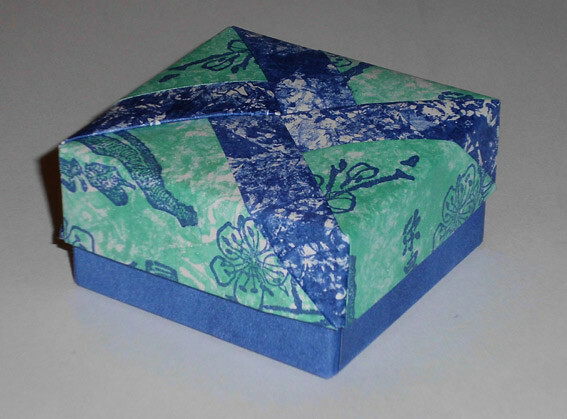 I was surprised to see an origami-box, how wonderful. Congratulations Sabine. . .LOVED your profile / interview and your project is wonderful!! Enjoy your month in the spotlight!!! 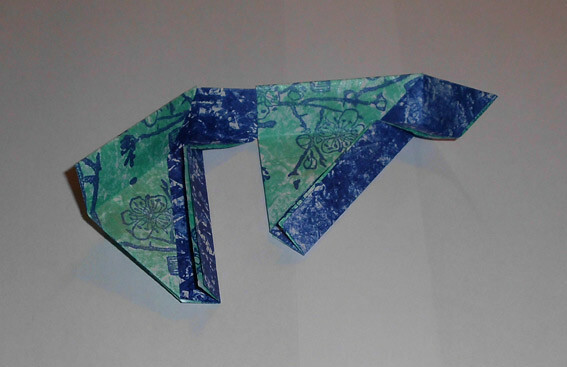 WOW another member who makes origami look so easy when it is so hard for others, like me. GREAT PROJECT, Sabine. You fill the SAM slot perfectly. CONGRATULATIONS. Congrats Sabine, I love your interview and of course your project. and the colours are gorgeous.have a super month. Lovely project Sabine ! and your interview was so nice to read. Congratulations Sabine 🙂 I really enjoyed reading your interview and love the origami box. Definitely something I’m going to have a go at. Congratulations on being this months SAM Sabine! Enjoyable bio and your box is stunning! 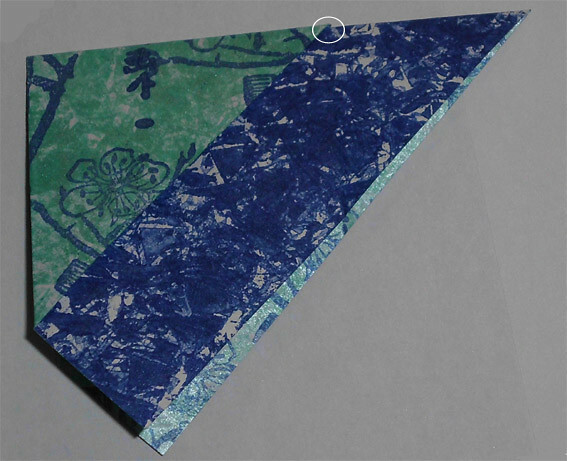 I love the way you created your own paper…gorgeous! TFS and enjoy your month! Congratulations Sabine! Loved your bio and project. A long overdue honor. Enjoy your month as SAM! Congrats Sabine! Very interesting bio and beautiful box project. Thank you for the tutorial…will have to give it a try. Trust you will enjoy your month as SAM! Thanks a lot ladies ! OSA is the best!